A walk down Mission Street this morning revealed plenty of food items available for breakfast, but the healthy options were way fewer than the non-healthy options, which also tend to be costlier. For example, while a soda can be had for a couple of bucks, that nutritious green drink will set you back about eights dollars. On face value, it’s easier on your wallet to opt for the cheaper treats, from donuts to bagels, but what is the cost to one’s health? Polls from renowned worldwide organizations, such as the World Health Organization, consistently place the United States way down the list of healthiest nations. While we have a health care system envied by many for its research and surgical know-how, the for-profit system seems more geared to curing disease rather than preventing maladies. The American dinner table is in bad shape. Portions are huge, with seconds the norm. There is a paucity of green items, with white foods dominating most plates. Supper is generally followed by a sugary treat, as ice cream and cookies vie for popularity with pie and cake. Coupled with a lack of exercise–with after-dinner walks way less common than time staring at a device–the nation is suffering from a health crisis. To meet the challenge of bettering the nation’s health, April 6th to 12th is “National Public Health Week.” The goal is to get Americans to take a look at their health habits. To start, the idea is to have Americans sign a pledge, from the American Public Health Association, to take care of their health, so that in 2030 the United States will be the healthiest county on the planet. There is also a petition to create a groundswell of support for legislators to promote health nationwide. Things are not better closer to home in San Francisco’s Mission District. Data in the San Francisco Community Health Assessment and Profile (September 2012, page 41), compiled by the San Francisco Department of Public Health, showed major issues in the community. The research revealed a 56.9 obesity rate for San Francisco Latinos, meaning a Body Mass Index (BMI) greater than 30. Another 17.4 of Latinos in the city were estimated as overweight, with a BMI between 25.0-29.9. There is an urgent need to address this health crisis. 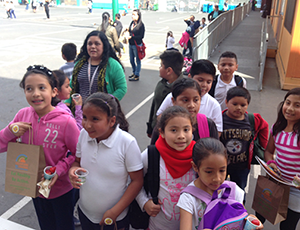 As a way to educate the community, on Friday, March 20th, the Mission Promise Neighborhood held a Chavez Health Fair, with 150 bags of healthy snacks handed out to the elementary school students. MEDA’s Community Health & Safety Manager Avni Desai knows this education needs to start at an early age. “”We need to make the healthy choice the easy choice for our children and their families in the Mission. Providing healthier landscapes and educating families about health is crucial to ensure our children are achieving and families are succeeding,” explains Desai of the need. We urge you to sign the American Public Health Association pledge today. For the nation. For your family. For you. San Francisco, CA –The Mission Promise Neighborhood (MPN) has announced its receipt of a grant to foster street safety for Mission District residents. The Department of Public Health and the San Francisco Municipal Transit Authority have partnered with agencies serving corridors of high pedestrian injury to bring awareness about street safety. In 2014, the MTA rolled out this initiative with an ad campaign on buses, light rails, in bus shelters and at light-rail stations, with the goal to promote awareness about street safety. Last year’s pedestrian statistics showcase the need for education, with 800 struck and 21 killed in San Francisco. This year has not started off any better. On January 10th, a motorcyclist suffered fatal injuries after colliding with a pedestrian on Van Ness Avenue and McAllister Street, right near City Hall. The pedestrian survived. The Mission District has not fared any better in 2015, with two incidents of note last week. On January 29th, in broad daylight, a three-year-old was struck by a car while crossing at Mission and 21st streets. The following day at the nearby, bustling intersection of Mission and 16th streets, a MUNI bus and a car collided, with pedestrians scrambling to avoid being struck. One innovative approach to be employed by the Mission Promise Neighborhood is to disseminate information on pedestrian awareness via promotoras, who have a long history in the Latino community of outreach on safety issues. MEDA will also be convening a community forum on this issue in March, with the Department of Public Health and the San Francisco Municipal Transit Authority invited. A stroll through the bustling Mission this morning revealed some scary scenes. A pedestrian texted while crossing at Valencia and 24th streets, oblivious to the cars turning in his direction. A few places north, a bicyclist brazenly weaved in and out of traffic. Over on Mission and 19th, a car sped up, barely make it through the red light, thereby endangering a mother pushing a baby stroller. These scenes are played out daily in tightly packed San Francisco, with a population density of 17,246.4 per square mile according to the 2013 American Census Survey (second only to New York City). San Francisco is definitely a city where one needs to be careful when heading from Point A to Point B, whether on foot or on wheels. The numbers are stark: 800 pedestrians were struck by cars in San Francisco last year, with 21 suffering fatal injuries. This is one of the worst records in the nation. Starting the year off on the wrong note, six-year-old Sophia Liu was fatally run down in a crosswalk at Polk and Ellis streets in the Tenderloin. Her mother and four-year-old brother survived their physical injuries, but were left to deal with the emotional pain of a young girl’s life cut short. Then there was the case of Priscilla Moreto in late October. The 68-year-old employee of the City Controller’s office was run down by a tour bus in a clearly delineated crosswalk on Polk Street, just outside the steps leading to City Hall. Ironically, city officials had held an event nearby just moments earlier, touting safety upgrades in the Civic Center. To combat this problem, MPN just received funding, through the San Francisco Department of Public Health, to conduct outreach on pedestrian safety. The first step will be a grassroots Mission District education campaign done via the MPN’s promotoras/es, community outreach workers. Please help the community and take the pledge today.